...Just because you are at uni now, doesn’t mean you are too old for fireworks fun! In fact it’s quite the opposite; why not celebrate tonight by throwing a bonfire party of your own or inviting friends over before heading on to a local firework display? Of course no party or festive occasion is complete without some well themed food, and for bonfire night I recommend the deliciously sticky Toffee Apple Cake. 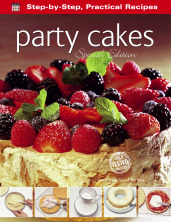 Although it may take a little longer than the student recipes so far, this cake is definitely worth it and will be a great hit with your friends. What’s more, the ingredients list is pretty simple and apples should be fairly cheap at this time of year. 1. Preheat the oven to 180˚C/ 350˚F/Gas Mark 4 10 minutes before baking time. Lightly oil and line the bases of 2 x 20.5 cm/8 inch sandwich tins with greaseproof or baking paper. 2. Thinly slice the apples and toss in the brown sugar until well coated. Arrange them over the base of the prepared tins and reserve. 3. Cream together the butter or margarine and caster sugar until light and fluffy. 4. Beat the eggs together in a small bowl and gradually beat them into the creamed mixture, beating well between each addition. 5. Sift the flour into the mixture and using a metal spoon or rubber spatula, fold in. Divide the mixture between the 2 cake tins and level the surface. Bake in the preheated oven for 25–30 minutes, until golden and well risen. Leave in the tins to cool. 6. Lightly whip the cream with 1 tablespoon of the icing sugar and vanilla essence. Sandwich the cakes together with the cream. 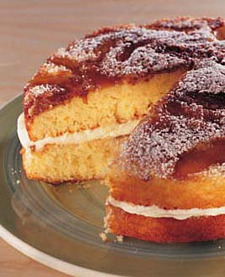 Mix the remaining icing sugar and ground cinnamon together, sprinkle over the top of the cake and serve. If you are feeling particularly adventurous why not replace the dark brown sugar used in this recipe with a dark muscovado sugar? This will give a deliciously rich toffee flavour to the apples and when baked the sugar will melt slightly into a caramel consistency, mmmmmmmm.